(OTTAWA, ONT.) Wheelchair Basketball Canada congratulates three-time Paralympic gold medalist Patrick Anderson of Fergus, Ont., on his induction into the Centre Wellington Sport Hall of Fame. The induction ceremony took place June 20th, at the Centre Wellington Sportsplex in Wellington, Ont. Anderson was a key fixture on the Canadian Senior Men’s National Team between 1998 and 2012, helping Canada win back-to-back Paralympic gold medals in 2000 and 2004. Following a silver medal at the 2008 Paralympics, Anderson played a key role for Canada at the London 2012 Paralympics leading the team to its third gold medal in the last four Games. In addition to his successes on the Paralympic stage, Anderson also led Team Canada to two World Championship bronze medals, in 1998 and 2002. With an all-star performance, Anderson became a World Champion as Team Canada captured the gold medal in 2006. Largely considered to be the best wheelchair basketball player to have ever played the game, Anderson’s tremendous work ethic and commitment to excellence has earned him countless team and individual accolades. 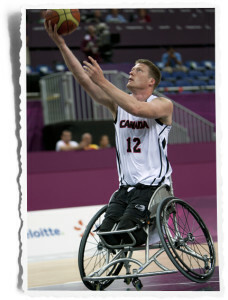 A full list of his accomplishments can be found online at: http://www.wheelchairbasketball.ca/players/patrick-anderson/. In addition to Anderson, Jane Kirby, a member of Canada’s National Senior Women’s rugby team, and Jamie McGinn, a winger for the Colorado Avalanche, were also inducted into the Central Wellington Sport Hall of Fame at the June 20th ceremony.